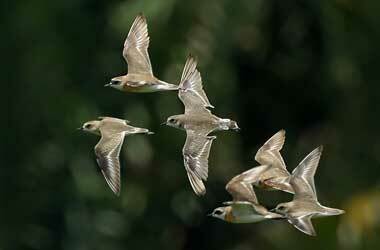 Singapore’s migratory bird season : October to March, every year. For nature lovers, bird lovers, outdoorsmen and women, the curious, the explorer … this is a wonderful opportunity to witness first hand, the amazing natural phenomenon of migrating birds. They move southwards to escape winter’s chill, on journeys as long as 7,000 kms (one way) and their flight patterns are based on an instinctive understanding of many things – the length of days, the earth’s magnetic field, the night sky, natural landmarks … and NParks endeavors to ensure Singapore remains a conducive stop-over point for migratory birds. Fun Fact : Every September to March, ‘bird-ringers’ from NParks tag the birds twice a month at the Sungei Buloh Wetland Reserve. Singapore uses green and white leg flags (single and two-colour flag combinations vary from country to country, revealing the bird’s previous destinations and migration patterns without having to recapture it). The birds are caught using fine, almost invisible 18m long nylon ‘mist-nets’ from dusk till the next morning. A small aluminium-alloy ring, each with a serial number and the address of the ringing stations, is fitted on one leg. Waders like sandpipers get a coloured plastic flag. The birds’ lifespan and feather replacement patterns are some of the information obtained from ringing. Previously tagged birds are released after their particulars are updated. The information is then sent to the first capture site. Data such as the bird’s weight and measurements, along with a unique code embedded in the rings, is logged into a system and sent to Australia where other participating countries can track the birds’ flight paths.